Dehydroepiandrosterone (DHEA) is a hormone that is produced in the body by the adrenal glands. The body uses DHEA to produce other steroidal hormones, such as estrogen and testosterone, depending on what the body needs most. Levels of DHEA in the body peak in a person’s late 20’s and then begin to decline. Supplementation of DHEA is said help reverse the effects of aging and is often touted as a “fountain of youth” supplement. Since DHEA can be a direct precursor to testosterone, supplementation may help with the building of lean muscle mass, fat loss, and strength increases. However, it should be noted that its unusual for anyone under the age of 35 to have a natural deficiency in DHEA. DHEA as a dietary supplement is manufactured from soybeans and wild yams. This syntheic form of DHEA can be found in tablet, capsule, liquid, and sublingual form. A double blind trail study conducted showed that supplementation 100 mg of DHEA daily was effective at decreasing body fat, improve body composition, and increasing lean muscle mass. DHEA is sold over the counter and can be found in most vitamin stores, however it’s best to take DHEA along with doctor’s supervision for best results as doctors can run test to check your DHEA levels. Standard daily dosage of DHEA is 25 – 50 mg daily depending supplementation needs. Skin health: 50 mg daily. Bone mineral density: 25 – 50 mg daily. Its best to find a DHEA product that has proper dosage for your specific needs. You will be able to find products containing a range from 10 mg to 100 mg DHEA per serving. Avoid products that contain bovine. DHEA supplements using plant based capsules and that contain no additives, fillers, or artificial ingredients are usually of higher quality. 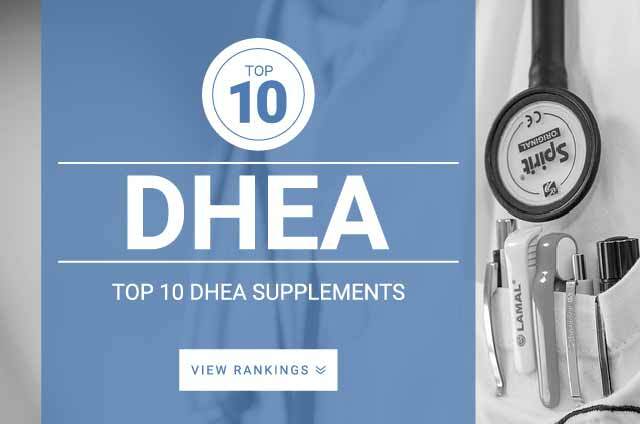 Refer to our top 10 list of DHEA supplements for our recommendations.